This watch features a stunning dial along with a new home time indicator (now an icon in the shape of a house). Verified Owner Comments: Very pleased with this watch. 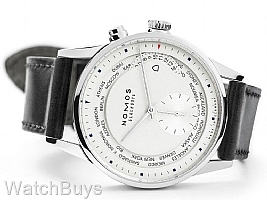 I looked at a lot of GMT and World Timers before deciding on the Nomos Zurich World Timer. I was looking for an understated look with simplicity of operation. Love the 40 size. Glad it's not bigger or smaller. This is my first purchase from WatchBuys. Phone service and shipping were exceptional and "as promised." Would do it again. Verified Owner Comments: The watch was everything I expected and have had two strangers ask where I purchased. Service couldn't have been better I travel a lot and had the watch scheduled for shipment on a specific day and it arrived as promised!